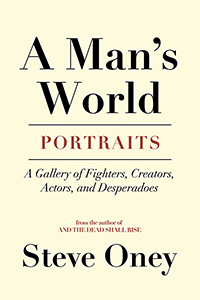 A MAN'S WORLD is a collection of 20 profiles of fascinating men by author and magazine writer Steve Oney. Written over a 40-year period for publications including Esquire, Premiere, GQ, Time, Los Angeles, and The Atlanta Journal & Constitution Magazine, the stories bring to life the famous (Harrison Ford), the brilliant (Robert Penn Warren), the tortured (Gregg Allman), and the unknown (Chris Leon, a 20-year-old Marine Corps corporal killed in the Iraq war). Several of the articles are prize winners. “The Talented Mr. Raywood” won the City and Regional Magazine Association Award for best profile in an American city magazine. “Herschel Walker Doesn’t Tap Out” won the Chicago Headline Club’s Peter Lisagor Award for best magazine sports story. “Hollywood Fixer” won the Los Angeles Press Club Award for best magazine profile. “The Casualty of War” was a finalist for Columbia University’s National Magazine Award. Although Oney has written about many other subjects during his career (his first book, AND THE DEAD SHALL RISE: THE MURDER OF MARY PHAGAN AND THE LYNCHING OF LEO FRANK, is an epic exploration of an infamous criminal case), he realized early that he was interested in how men face challenges and cope with success and failure. He was drawn to fighters, creators, actors, and desperadoes, seeing in their struggles something of his own. His agent, an ardent feminist, urged him to collect the best of his articles in a book. A MAN'S WORLD is the result.